Monday, 24th October: this day will go down in America’s Ultrarunning history, as the day on which a man managed to run from San Francisco to New York in only 42 days, 6 hours and 30 minutes, covering 3.067 miles (about 5000 km). 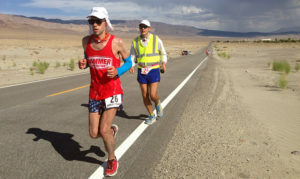 This man is the ultramarathon runner Pete Kostelnick, who had already won prestigious races such as the Badwater Ultramarathon. Pete destroyed a very old record record which was dating back to 1980, when Frank Giannino run for 46 days, 8 hours and 36 minutes. Followed by a four people team, the athlete (sponsored by Hoka One One) managed to mantain a rythm of 72miles a day (115 km) to keep an advantage of about 4 days on the previous chrono. By fullfilling this legendary challenge, Pete maintained a firm routine: he woke up every morning at 3 o’ clock, run for about 40miles, than stopped for lunch and run again for 30 miles more till late night. On average, he run about 14 hours a day for six months in a row, wearing out eight pairs of Hoka One One Clifton. Misfortune did not fail to appear: while crossing Utah’s territories, the american Forrest Gump bumped into a strong snowstorm which put him and his team in great difficulties. Congratulations to Pete Kostelnick who entered the history of running by establishing this new World Record! The question now is: how long will it last?